Emma Swan (Jennifer Morrison) gets married the Storybrooke Way, which means in front of a CGI sunset. 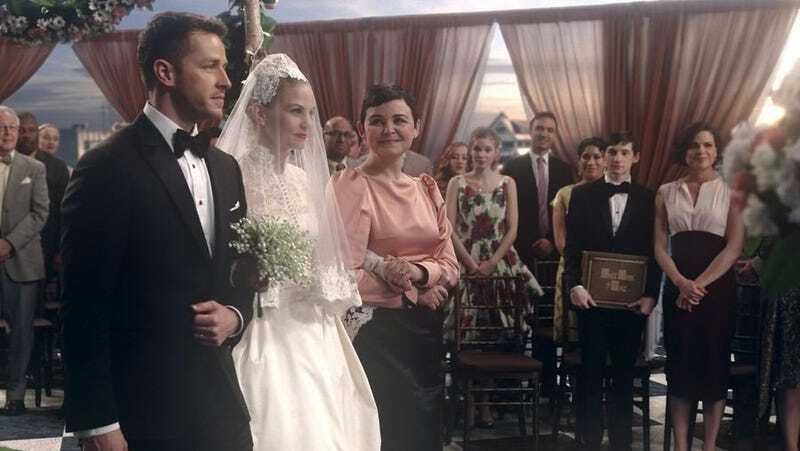 It’s been awhile since Emma Swan (Jennifer Morrison), Snow White (Ginnifer Goodwin), and Prince Charming (Josh Dallas) have set foot in Storybrooke. Since their departure, Once Upon a Time has tanked, leading to the storybook being closed for good at the end of this season. Now, it looks like the Charming family is coming back to town, one last time. But it looks like it’s going to be a bonafide Storybrooke reunion for Once Upon a Time. In addition to the core cast, we’ll also see the return of characters like Granny, Leroy, Peter Pan, Robin Hood, and Cruella De Vil (my personal favorite). Even Jared Gilmore is coming back as younger Henry, a role that’s since been filled by Andrew J. West. Sadly, no word yet whether Meghan Ory, who played Red Riding Hood for several seasons, will be coming back to say goodbye. Once Upon a Time airs Fridays, and the final episode comes out in May.